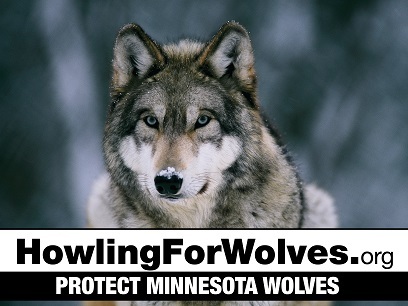 Donate $20 and receive a lawn sign that will convey your position on protecting wolves. The signs are of a typical election lawn sign size. Please choose either or both of two signs: "Protect Minnesota Wolves" and a more graphic "Trapping Is Torture". Use your discretion on which sign will be more appropriate in your location. The donation is not tax-deductible, it goes toward our 501c4 Howling For Wolves Action Fund. The donation price includes shipping and handling. To order by mail, download the Order Form. Lawn signs will be shipped only to US addresses. Please don't order from other countries.